These beautiful rustic pies take the fuss out of preparation but deliver on flavour. The are a great alternative for dessert when you are craving an apple pie but haven't got the time or patience to make one. 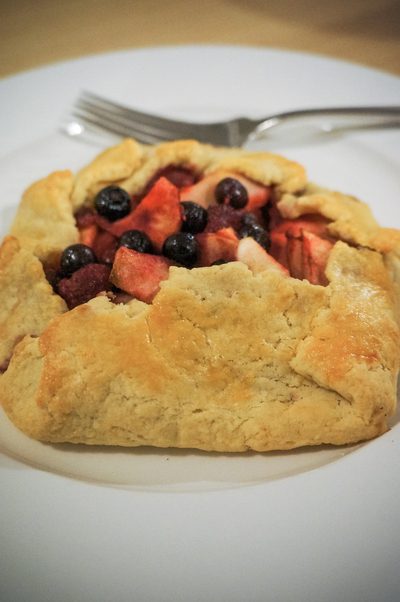 The combination of the berries with the apple is a match made in heaven. Top with a big dollop of cream or custard! yum! Put flour, icing sugar and unsalted butter in a food processor and blitz until mixture reveals fine crumbs. Add egg yolk and water and mix until the dough comes together in a soft ball. Wrap dough in gladwrap and put in the fridge for 30 minutes. Meanwhile, make the filling by combining all the ingredients in a bowl and mix together. Set aside. Preheat oven to 190 C. Line a baking tray with baking paper. Divide the dough in to four even-sized balls and roll out on a lightly floured surface to about 15cm in diameter. Place on baking tray. Spoon a handful of the berry mixture and place in the middle of each pastry round, leaving a 3cm border. 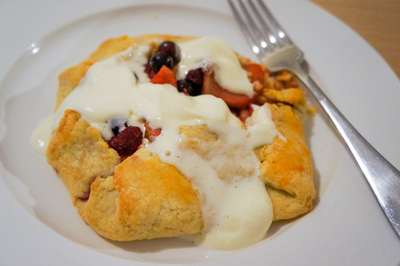 Gently fold the pastry over to enclose the filling and press down lightly to seal. Lightly whisk one egg and brush the edges of the pastry with it. Bake for 20-25 minutes or until pastry is golden. Remove from oven and serve with whipped cream or custard.